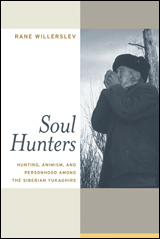 This is an insightful, highly original ethnographic interpretation of the hunting life of the Yukaghirs, a little-known group of indigenous people in the Upper Kolyma region of northeastern Siberia. Basing his study on firsthand experience with Yukaghir hunters, Rane Willerslev focuses on the practical implications of living in a "hall-of-mirrors" world—one inhabited by humans, animals, and spirits, all of whom are understood to be endless mimetic doubles of one another. In this world human beings inhabit a betwixt-and-between state in which their souls are both substance and nonsubstance, both body and soul, both their own individual selves and reincarnated others. Hunters are thus both human and the animals they imitate, which forces them to steer a complicated course between the ability to transcend difference and the necessity of maintaining identity. Rane Willerslev is Associate Professor in the Institute for Anthropology, Archaeology, and Linguistics at the University of Aarhus, Denmark. He is also the author of Hunting and Trapping in Siberia (2000).